The first two days of Certified LeSS Practitioner were engaging and challenging. I went into the course thinking I could tweet interesting snippets as we went through; however there was no time for tweeting or distractions it constant thinking, doing, speaking. Hearing and following through the questions of others in the course was often very interesting. The last day was not nearly as engaging due to several factors: I was tired, the content shifting to a light touch of the remaining rules of LeSS and Venki mentioning we were on track to finish early; consequent the participants but the brakes on. We were provided a long reading list of books, articles, videos and set a knowledge test. The test was not referenced/used in the training and some of the answer conflicted with Venki’s teaching. 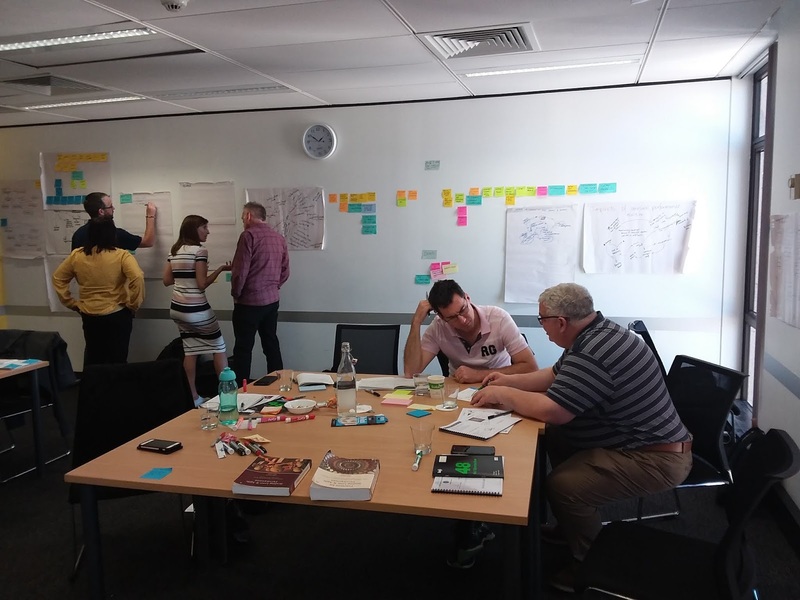 Several people in the class had fragile knowledge of scrum, did none of the pre reading and managed just fine. I had already consumed many items on the reading list several years ago. I re-read some of the articles, watched a few videos and found that they were not a cohesive set of learning materials. It seems they were every public article of LeSS published, with lots of duplication included. This reading list should be shortened significantly perhaps just to the rules of LeSS and a video or two for background. We were told to bring laptops to work on, but only needed one per table of people to read the scrum guide. We were also encouraged not to take electronic notes, instead were handed 48-page exercise books and encouraged to take notes, which actually worked really well. My suggestion would be that laptops were discouraged during the lead up and printed copies of the Scrum Guide provided to each group. While the first two days were engaging, it felt like we were on a roller coaster blind folded; only Venki knew where we were going. Jumping from topic to topic without structure, without order, ignoring the printed slides, it was hard to know if we were making progress. While it sounds terrible I can’t make out if it is a strength or weakness of his delivery. As questions were raised we would deep dive on the topic, the reason why and potentially tangents to that topic. Venki did make sure that everyone’s question were answered. Sometimes those answers were in the form of a question, or reference to a principle; forcing us to think through the question and find a suitable answer. I feel that this approach was key to the engaging nature of the training. LeSS is Scrum, what is Scrum, how are they the same, how are they different. The content only lightly touched on was. I found it interesting that Venki played funny videos after each break session. It surely lightened the mood, however only a few of them were directly related to the training course. Most of them had a tenuous connect at best. Most of the interactive exercises were fun, interesting and embedded knowledge in us; such as designing a multiple team sprint planning approach, casual loop modelling of feature teams vs component teams. 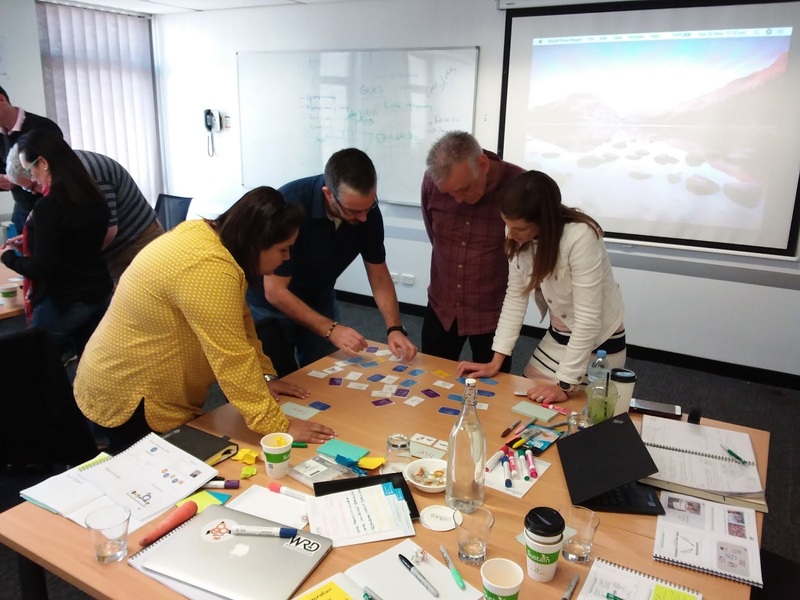 There were several interactive exercises that fell down in delivery and/or opportunities for learning. i.e. While searching for hidden post-its around the room with types of wastes written on them was fun, yet it delivered almost nothing in the way of knowledge. Use LeSS to descale / simply the target area of the organisation through empirical process control. Don’ t use LeSS to scale up your existing agility. LeSS is designed for a big bang change (limited to the target area of the organisation). i.e. The vast majority of teams MUST be fully cross functional feature teams, otherwise you are not doing LeSS. The initial perfection vision of LeSS is a potentially shippable product increment every two weeks. Once that is achieved aim for one week. Concept of understanding the System Optimising Goal of all systems you are interacting in / part of. I.e. What is the company/CEO’s System Optimising Goal? Is that the same goal as your area? Is it the same goal as the tool you are using? Thinking in Systems: A Primer by Donella Meadows, is worth reading prior to the 5th Discipline by Peter Senge. “Thinking in Systems” will provide the though patterns that make it easier to digest “The 5th Discipline”. Using a WIP limit indicates that there is a problem that you are not solving. Perhaps another team is flooding your team with work? Perhaps your own has an uneven flow? Make all queues visible, then reduce/remove those queues. Use LeSS Huge only when your one PO can’t handle the number of teams that you have. The 2-8 teams for LeSS is just a guide based on the worst and best PO’s they have seen. 9 teams is not the trigger point for LeSS Huge, it is purely down to the ability of the PO to handle the teams you have or not. If you have LeSS huge try to only break out a new Product Area when you have 4 teams. This is so that the PO can keep those 4 teams effectively occupied. They have seen that having less then 4 teams for 1 PO often leads to starvation of those teams backlogs. So why do they suggest that use LeSS when you have 2 or 3 teams? The answer is that there is no better solution, better off using LeSS and potentially suffering some starvation than to not use LeSS when you have multiple teams. Product Areas may be made up of multiple “themes” this is especially true when those themes only need a team or two to service them. E.g. 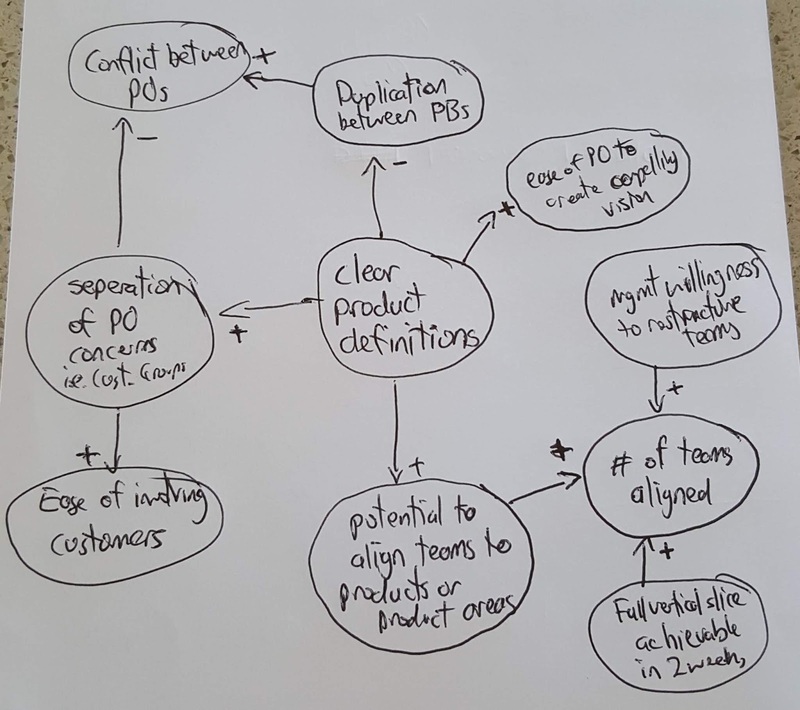 your 4 team Product Area may be made up of 2 teams for theme A, 1 team for theme B and 1 team for theme C.
How can 1 PO handle 4 teams, let alone 8? The answer is to just to Strategy, Vision and Prioritisation. Leave the clarification of User Stories to the team who work directly with the customers. Cutting out this clarification effort frees up the PO to work with more teams. When you need to seed knowledge across multiple teams; try creating a temporary “undone” team with someone who is strong in the desired skillset and stack the rest of the team with people who are keen to learn that skill. Temporarily they do all of the work related to the skill, once they have learnt the skill, the team is disbanded and they take their new found knowledge back to their feature team. 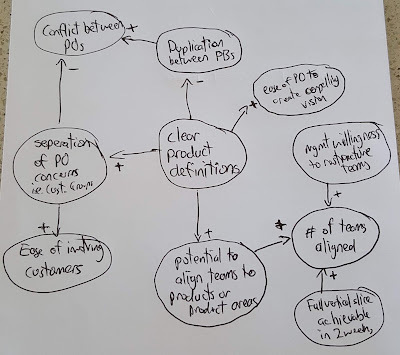 If you must have a distributed PO, place them in the same location as the customer(s) in preference to placing them in the same location of the team(s). The reason being they deliver the most value from better understanding the customers needs. While LeSS demands that most teams are Feature Teams, it accepts that there will be some service teams, such as finance, admin, etc. It also accepts that the feature teams DOD may not be complete especially in the early days. That undone work will be covered by team(s) called “undone”. The name was chosen deliberately to be unappealing, because the aim is to get rid of those team(s) ASAP and have that work done by the features teams within the sprint. Multi team Product Backlog refinement has recently been made the default over separate team Product Backlog refinement. Have a clear product definition is crucial to a successful LeSS implementation. This definition should be as broad and as end user centric as possible. The action plan from each team’s retrospective is shared at the overall retrospective. This is intended to prevent duplicated effort and worst still actions that interfere with each other. The Overall Retrospective is held early in the next sprint, it is not held on the same day as end of sprint. Every new role created in an organisation, disempowers another role somewhere in the organisation. Financial matters are handled by the Product Owner in LeSS Huge it is still the single PO that handles the $$$. Organisational agility is constrained by technical agility.